Small and simple. Acer presents a 14-inch convertible dubbed Aspire R14 R3-471TG-552E that is to convince us with its elegant design, a 360-degree display, and decent system performance. Unfortunately, the screen does not quite meet our expectations. 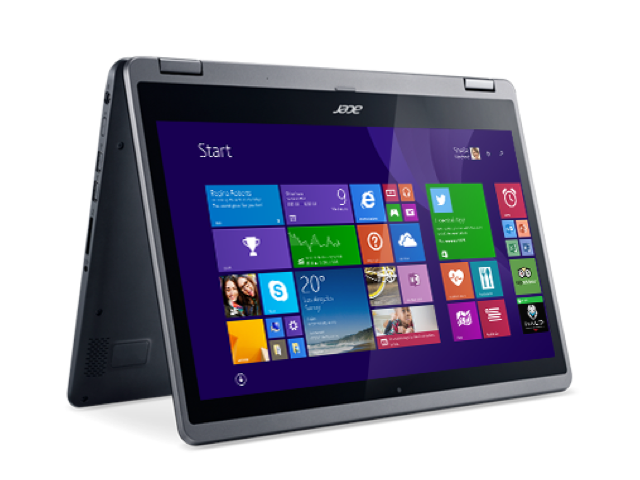 There’s a lot to like about the Acer Aspire R14. At only $650 it’s affordable and looks great with its faux aluminum design. The device is powerful enough to handle most computing tasks and the Zero Air Gap screen design allows for precise and responsive touch controls. Unfortunately none of that makes up for the fact that the underlying display is subpar. The limited 1366 x 768 resolution isn’t really acceptable these days considering the laptop’s cost. The screen not only suffers from narrow viewing angles but the glossy screen surface is even more problematic due to its highly reflective nature. Model: Convertible laptops are becoming quite a popular trend and Acer has made a 14 inch option whose display can twist 360 degrees to achieve four viewing modes. In addition to the normal laptop mode, the keypad can be twisted all the way to the back to give a notepad mode, or twisted into L shape for watching videos and a tent shape for easy display while busy working with your hands. The 14 inch screen has a resolution is 1366 x 768 pixels and is multi-touch sensitive. The screen features the new Zero Air Gap technology that makes graphics appear sharper, more colorful and more vibrant. As you flip the convertible around, the screen will automatically detect your preferred orientation and adjust to it accordingly. The plastic body cover is made to look and feel like aluminum and that really gives it a classy and elegant feel. However is does weigh almost 2 kg and is 2.5 cm thick, which is not really slim. This convertible is powered by an Intel Core i5 -4210U processor that clocks at up to 1.7 GHz, which is combined with an Nvidia GeForce 820M graphics card, 8 GB of RAM and 1 TB of internal storage. Another great feature is that the touchpad has precision technology that can distinguish accidental bumps or scratches from real and intentional movements. Overall, it is worth considering if you want versatility in usage.